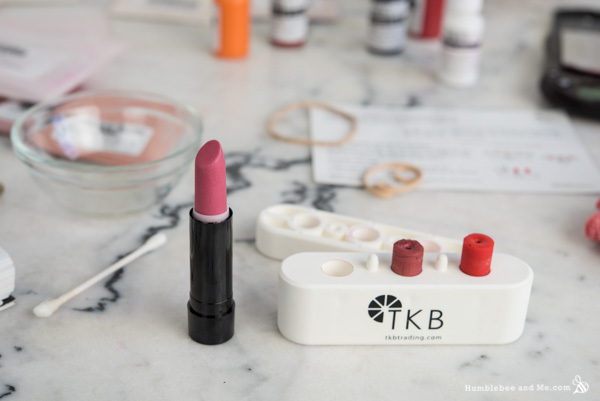 I’m often asked about making stick lipsticks, and turning the lipsticks from Make it Up into stick lipsticks, so I was super excited when TKB Trading got in touch and asked if I wanted to try their new (inexpensive!) lipstick mould. I’ve definitely looked at lipstick moulds in the past, but the aluminum ones seem to start close to $200USD with all the parts, plus international shipping and duties. Not only did I not want to spend that kind of money, I was also pretty sure most Make it Up & blog readers wouldn’t want to, either, so I just figured stick lipsticks weren’t in my future and carried on with some pretty glass pots. Want to see this project in action? 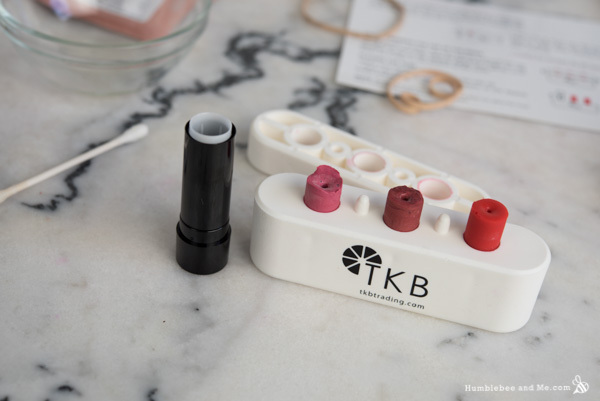 I guess TKB has noticed the gap in the market for a lipstick mold for those of us who want to dabble, so they developed and launched this sleek little $19 alternative. It has three cavities, works beautifully, and I am having a ton of fun playing with it! I’m really impressed with the mold itself. It’s a simple, white plastic, two-piece deal. The base has three cylindrical cavities in it, with the classic lipstick shaped taper/tear-drop happening at the very bottom. The top has three matching cylindrical holes that line up with the base. The two pieces slot together with a pair of pegs. It’s been standing up to use really well without any noticeable staining, and it’s very simple to clean with a cotton bud dipped in a bit of oil. To use the mold, rubber band the two parts together and oil up the inside of each cavity with a cotton bud dipped in oil. 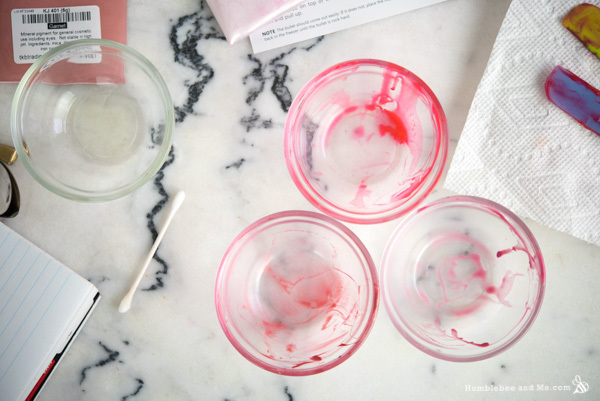 Pour the molten lipstick into the mold, let it set up a bit on the counter, and then transfer it to the freezer. The instructions recommended freezing for 20–30 minutes, but I found I’d often leave it in longer, mostly due to forgetting about it. 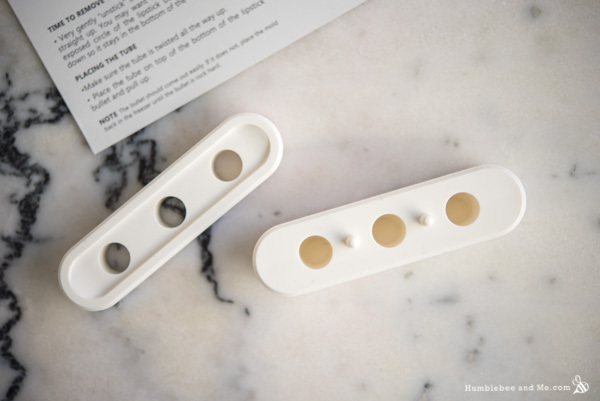 TKB says the longer the better, so you could even do this before bed and then unmold in the morning (this is especially helpful if you’re using a softer base). To unmold, start by removing the mold from the freezer, removing the rubber bands, and pulling the top part straight up. I always found this happened pretty easily, even if it is a touch nerve wracking. Up next, screw the base of your lipstick tube all the way up, stick it onto the exposed nub of lippie, and then pull straight up. If all has gone well the tube of lipstick will slide out easily and you’ll be rewarded with a beautiful, glossy tube of lipstick in its own lovely lipstick tube! In addition to the mold and some rubber bands you will need proper lipstick tubes (not lip balm tubes). TKB has quite a lot to choose from; I mostly stuck to the Economy and Shadow Black as they’re the most inexpensive ones they offer (<$1/piece), and I really like them so far! 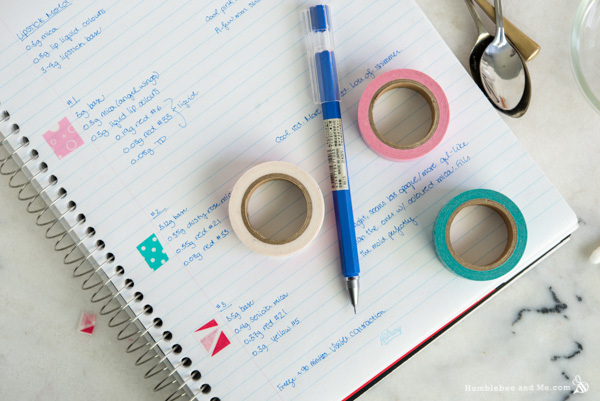 I’ve been distinguishing my blends from one another with washi tape, which looks lovely on the tubes. 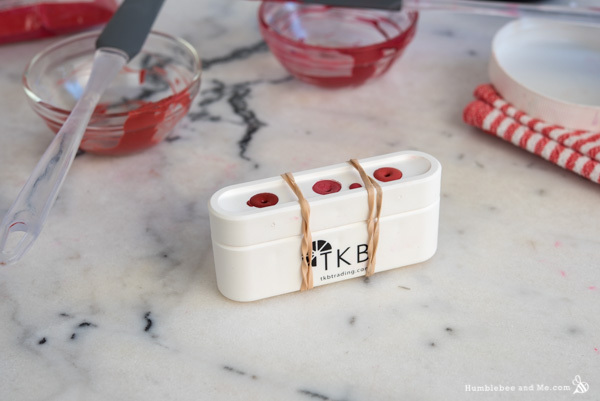 Having never made molded lipstick before, I started with the TKB Trading Lip Stick Base, micas, and their pre-dispersed liquid lip colours, as recommended, so I could start with something that should work and get a feel for it. 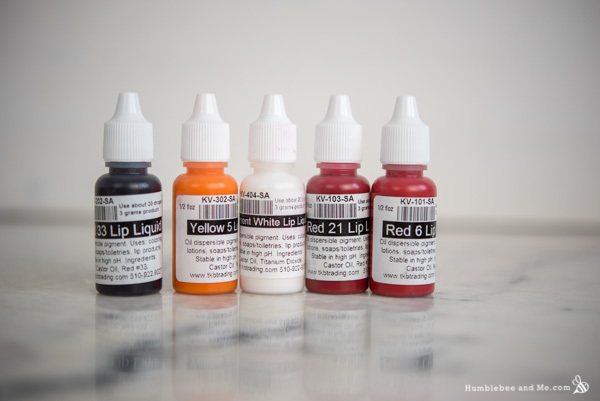 The basic instructions from TKB are to “blend 0.3 grams (1/8th teaspoon) of mica powder and 0.3 grams (about ten drops) of TKB Lip Liquid to 3 – 4 grams (1/2 – 3/4 teaspoon) of lipstick base.” I found that 3.5g of base is perfect for filling the mold. I also had a lot of fun playing with different concentrations and blends of pigments and micas! I found I generally preferred more pigment than they recommended, but not as much as I usually put in pot/jar lipstick. From here, let’s dive into my experiments and notes so you can see how things developed! As one of the primary things I was concerned with was pigmentation, I’ve included pigment percentages for each blend, but please take these with a grain of salt. I used pure powder pigments (oxides and lake dyes), micas, and liquid lip colours. Only the powdered pigments are pure pigment, while the micas and liquid colours are diluted with micas and castor oil, respectively. I’m unsure of the concentration of pigment in these diluted colour ingredients so I’ve called all of the ingredients “pigment” for the percentages. This obviously isn’t perfect, but it gives a bit of a starting point for comparisons. These ratios are the ones recommended by TKB, using the lower end of the 3–4g base recommendation. 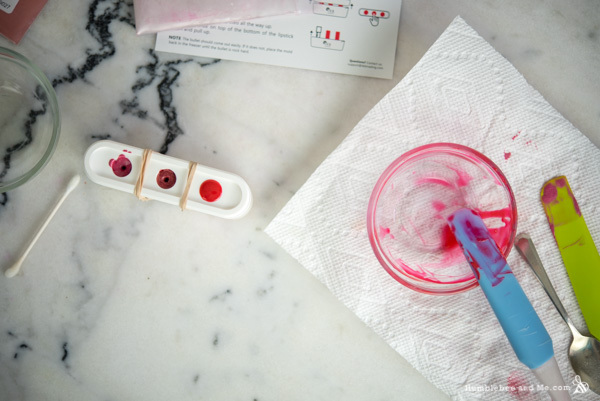 This created a soft, cool pink with a low-to-medium pigment level—I want more pigment! 3g of base wasn’t quite enough to fill the tube. 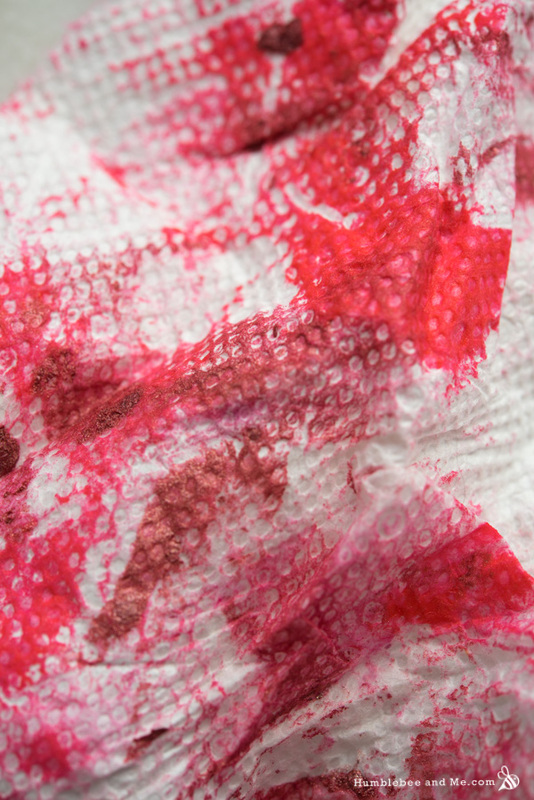 A deeper, cool red with slightly stronger pigmentation. There’s also a lot of shimmer in this one! There’s still not quite enough lipstick to fill the mold cavity. With this one I wanted to try reducing the shimmer, but keeping the powder, as TKB recommended including some powder to improve colour transfer—so I tried sericite mica instead of a shimmery, pigmented mica. I also stepped up the amounts of liquid dye—#2 was 10.8% liquid lip colour, and this one is 14.66%. Replacing the coloured mica really impacted the colour and brightness, though—this one has an almost gel-like appearance/colour pay-off. It’s lovely! Because it isn’t fully opaque it looks much brighter in the tube than it does on the skin. It’s somewhere between a tint and a full lipstick. I love it! From left to right, lipsticks 1, 2, and 3. All three of these first lipsticks unmolded perfectly, and really easily, which was awesome for boosting my confidence! Each tube slid out effortlessly and perfectly and just… swoon. They look great and apply beautifully. I used apricot kernel oil to lubricate the mould for the first six lipsticks. For my next round of experiments I wanted to amp up the pigmentation! 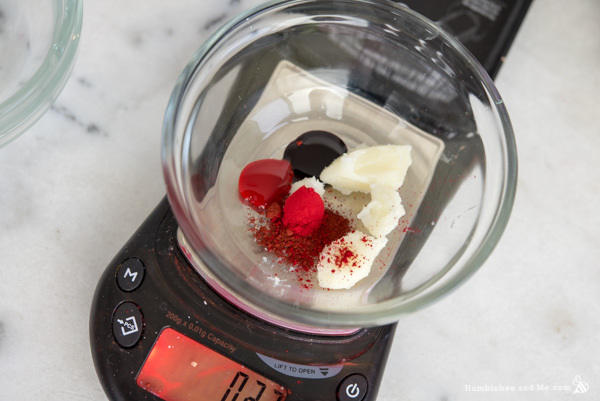 I’d settled on 3.5g of base per recipe, so with that finalized I could really start to tweak the amounts of pigments I was using. No micas in this one—just pigments (both powdered and liquid). Definitely much more pigmented, though the addition of the powdered pigment required more blending (which isn’t at all surprising). Approximately 19.17% pigment, though there’s no mica in there, and some of that is pure pigment, so it is definitely stronger than #2 (~19.79% pigment). I went with purely powdered pigments here, adding 0.2g castor oil to try to account for how the original recipe specified the use of pure pigments pre-distributed in castor oil. This one was really strong in the colour department—possibly too strong. It calculates at 15.53% pigment, but that’s all pure pigment—nothing diluted in mica or castor oil. This was my first stab at using a base of my own, and I elected to use some cream blush from Make it Up as I already had a big batch of it in my fridge, so I could just dole some out and carry on. The base is about 30% beeswax, so it’s relatively firm, and the pigment percentage is about 4% pure pigment. This was the first one that didn’t unmold perfectly, and straight away. The top section came away from all tubes of lipstick easily enough, and #4 and #5 slid right out with their tubes, but #6 didn’t want to go anywhere. I’d snug the tube down around the exposed nub, pull up, and be left with an empty tube and a nub with some new grooves it it. Boo. It did not want to budge. In the end I froze the remaining, stubborn bit of cream blush for about two days, then stuck the tube over the nub, froze that for a few more hours, and then was able to unmold it! WOO! It wasn’t perfect (some product stuck to the mold around the neck—more oil around the inside of the mold next time, perhaps? ), but at least it came out! Left to right, lipsticks 4, 5, and 6 in the mold. Alright! 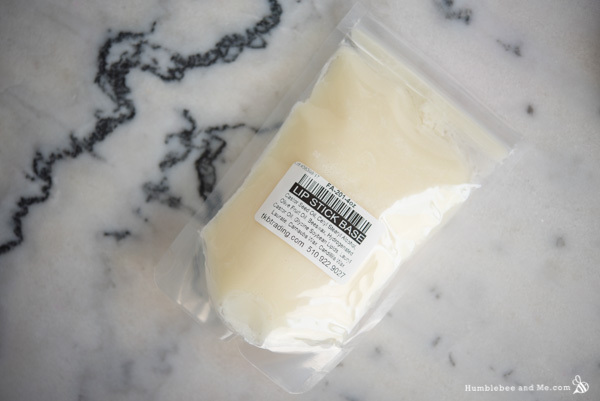 I’m now confident that the TKB base performs wonderfully and will work well as a constant, so now it’s time to dive into using my own lipstick base recipe and see how that goes in comparison. For these experiments I’m using the Long Wear Lipstick base from my book (Make it Up, page 164). I began by whipping up a batch of the base to use. 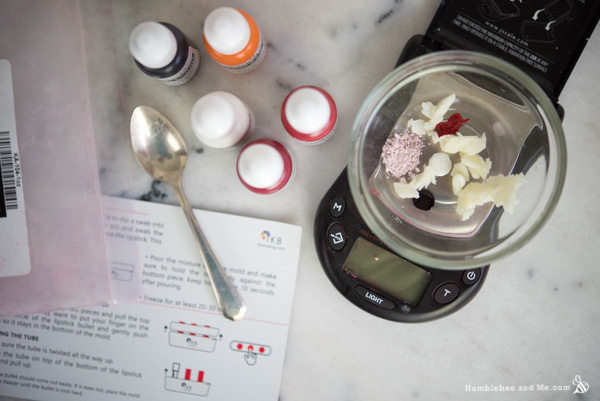 The recipes in the book call for 5g (0.18oz) of base per colour blend, and we just need 3.5g (0.12oz), so I reduced the colour blend by 30% to account for the smaller amount of base (3.5g is 70% of 5g). Because the pigment blends in Make it Up are all by volume, I had to do a bit of weighing to get my percentages for the pigments, and go from there. A bit of quick spreadsheeting revealed that this beauty rings in at a whopping 33.59% pigment (24.39% if you exclude the mica). Compared to #5, our previous “lots of powdered pigments and the end result is really strong” lippie, this one has about 10% more pure pigments. Whomp. When poured, I noticed this one “divetted” in the centre much more than the others. Knowing this one would probably be tricky to unmold, I decided to use some dimethicone 350 to lubricate the mold instead of an oil. Despite my efforts, this one failed. I was able to get the top of the mold off, but the stick of lipstick broke as I tried to pull it out of the mold with the tube. Boo. Before I’d even poured #7 I got this version on the move—a version with half the amount of pigment. This takes us down to 19.91% pigment (14.42% without the mica). This is much more in line with the pigment percentage in previous successful versions. This one also failed—it broke apart as I separated the mold. Boo. The only difference between #8 and #9 is the base; this one uses the base from TKB Trading. Both were lubricated with castor oil. This one came out of the mold perfectly, proving it’s more about the base than the amount of pigment. The failed lipsticks. The far left & centre lipsticks use my Long Wear base. The one that worked uses the TKB base. I’ve definitely only scratched the surface so far, but here are my learnings up to this point. I played around with different pigments, different concentrations and different lubricants, but the make-or-break factor was always the base. 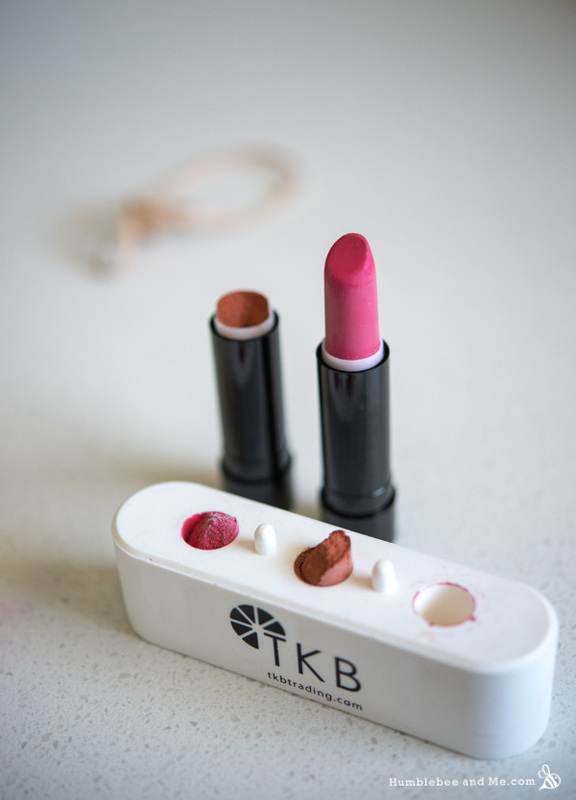 When you’re getting started I’d recommend using TKB’s Lip Stick base—it worked beautifully every time and made great lipsticks. Meanwhile, I’ll be working on developing my own stick-friendly base! Lipstick in a pot is applied with a brush. 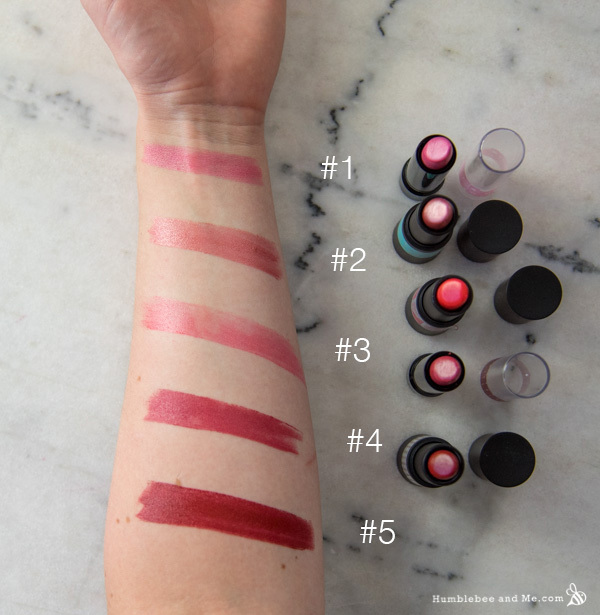 Stick lippies are held directly to the skin to be applied, and because of this they melt much faster and deposit a lot more product, a lot faster. For this reason I find I prefer a less pigmented stick lipstick—when I tried to match pigment levels to pot lipsticks I found the end product felt like it went on like a permanent marker! They just stir right in. It’s amazing. If you can get some, I recommend it. Just be careful to account for the added liquid—too much can make your lipstick too soft and it won’t unmold well. I’d probably aim for 15–20%, keeping solid pigments <15% and making up the rest of the difference in liquid pigments or micas. That’s just a guideline, though! This is such a fun little mold, and it’s a great way to get into stick lipsticks for less than $20. 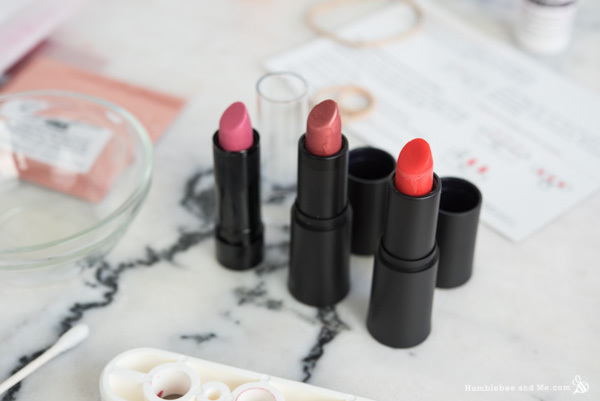 It works well assuming your recipe is mold compatible, and I am loving having my lip colours available in easy-to-apply stick form! It’s easy to clean and is holding up beautifully so far. I definitely recommend this fun little mold if you like stick lippies! I think the only downside is how hard it is to dig a failed tube out of the mold, though this would be an issue with any lipstick mould that didn’t open up like a book. Up next—creating my own base recipe that is mold compatible! 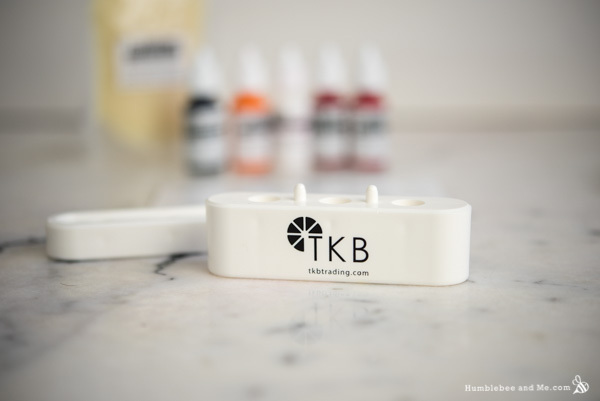 I’ve learned a lot from working with the TKB base—it’s much firmer than the ones in my book, and much less powdery. I think the lack of powders makes it a bit slicker, too. The lipsticks that broke on me almost looked like they’d been torn; I could really see the powdery texture in the cross section. Hmm. Anywho—stay tuned! I was provided with this mold, some tubes, and some supplies by TKB Trading in exchange for my honest review. 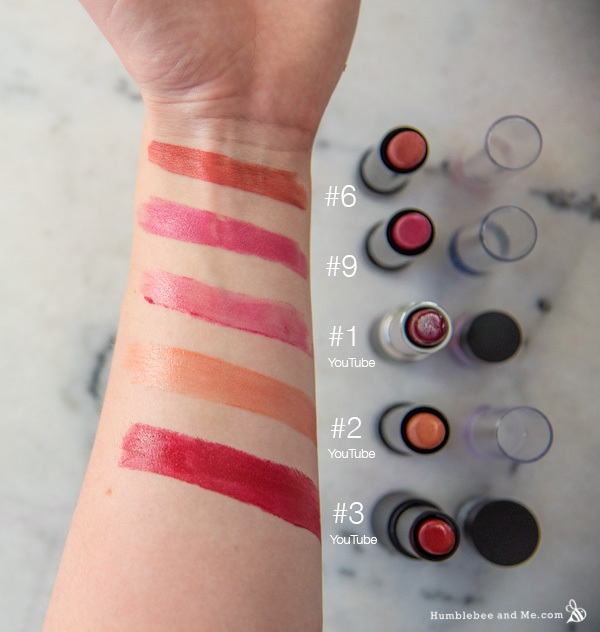 Wondering about the YouTube colour blends? Watch the video! I sometimes wonder if I’ll ever outgrow glitter. I don’t particularly want to, but I also didn’t want to realize the special effects in some of my favourite childhood movies are painfully bad. Sometimes these things just happen. One of my strongest glitter memories is from musical theatre in the tenth grade. I was fifteen, and my ensemble character, in true musical theatre fashion, wore a leotard and a truly staggering amount of glitter all over my skin and throughout my hair. Our performance was in early December, and I remember I was still finding glitter on myself on Christmas Day. I may have used too much. Anyhow, difficulties removing it aside, I still love the stuff. So, when I paid a visit to Windy Point a couple weeks ago to find Michele and Kate positively sparkling from packing up some brand new Iridescent Super Sparkle Glitter, and Michele was kind enough to send me home with some, well… my imagination went wild. This Fireworks Lip Gloss is the first thing I’ve made with it, but it certainly won’t be the last! Ok, so I may be a touch late to the party on this one, but isn’t rose gold the prettiest?! In the past I’ve shied away from pink. Not for me, I thought—too… pink  This stance has softened over the last few years and I now find that rose gold has nestled into a little pinky spot in my heart and I’m suddenly quite fond of it without even knowing how it happened. For the uninitiated, rose gold is a lovely soft pinkish hue, with a touch of subtle gold that catches the light every now and then. It’s utterly lovely, so it’s not hard to see how I decided I simply had to have a lip gloss in this lovely colour! Can I use a different essential oil (or essential oil blend) than what is called for in a recipe?